I recommend taking a peek at the book “Spaced Out” by Alastair Gordon (fun site, although as with many things ‘sixties’ not exactly ‘safe for work’), which is a look at the “crash pads, hippie communes, infinity machines, and other radical environments of the psychedelic sixties”. It’s an expensive ‘art’ book, gorgeously illustrated with hundreds of period photos. I find it kind of inspiring to see all the wild creations that were essentially built by ‘amateurs’ – there is minimal text, and what’s there just kind of touches the highlights. Gordon traces a sort of rise and fall of interest in building geodesic domes that happened over the course of a few years in the late sixties, then a move into more free-form structures. What is Seeing All About? I’ve recently finished two books written by Lawrence Weschler, both consisting of reports on his conversations with a particular artist over multiple decades, and I thought both were excellent. The first is an ‘expanded edition’ of “Seeing is Forgetting the Name of the Thing One Sees” on Robert Irwin from California (first edition in 1982), and the second is “True to Life” on David Hockney (a Brit, but long associated with southern California). Above is Hockney’s “A Bigger Grand Canyon” painting. Both artists became obsessed in different ways with the act of perception, and in particular vision. Irwin was raised in Los Angeles, and started off as a painter in the late fifties. His work tended in more and more minimal directions, such that by the late sixties he had pretty much stopped painting altogether. He moved in the direction of art installations, typically not making any decision about what he would do at a site until he got there and studied the location. Here’s what he said about the viewpoint he was rejecting: “The art world is highly invested in the idea that you can take an object and set it in a room, and the internal relationships will be so strong and so meaningful that all the kinds of change that take place on the object as a result of its being in a new environment will not critically affect our perception of the object.” (p. 151) Instead, Irwin was interested in highlighting the most subtle variations in light and space perceptions. The piece above is from 1969, and uses plastic discs and lights to create visual patterns. The piece above, while much more recent, illustrates something of what Irwin is up to. 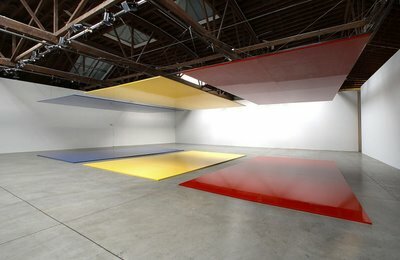 While in some sense nothing could be simpler than the three panels, one blue, one yellow and one red, with one set on the floor and one set hanging from the ceiling. But is that what we’re truly seeing? Look at the red panel on the floor – after the initial edge, most of it is not really red. Nor is the ceiling panel above it. Scientists tend to operate through a logical process in the material world. In science it seems necessary that your facts be concrete, repeatable, and predictable, which means there has to be an existing reliable form of reality. And the only reliable forms of measure, as far as science is concerned, are pure abstractions, that is, abstract systems which can be overlaid onto the world of experience…. Reasoning appears to be more confused, more haphazard, partly because of the scale of what it tries to deal with. The logical, in a sense, seems more successful because it cuts the scale down. In fact, that’s what makes it logical: it takes a very concise cut in the world and simply defines or refines by deduction the properties of that cut, but it never deals with the overall complexities of the situation. It only applies with the confines within which it operates, so it seems much clearer. The artist, however, as a reasoning being, deals with the overall complexity of which all the logical subsystems are merely segments, and he deals with them through the intuitive side of his human potential – and here inconsistencies are as meaningful as consistencies. Weschler got involved with Hockney after the first appearance of his Irwin book, as Hockney read it and felt that he disagreed with Irwin’s view of the world, yet couldn’t stop thinking about it. It was around that time that Hockney began making photographic collages, first with Polaroids in square grids, then with photos that did not follow a grid pattern. Below is an example, taken during a Scrabble game. … the major problem with traditional perspective, as it was developed in fifteenth century European painting and persists to this day in the approach of most standard photography, is that it stops time. For perspective to be fixed, time has stopped and hence space has become frozen, petrified. Perspective takes away the body of the viewer. You have a fixed point, you have no movement; in short, you are not there, really. This is the problem. Photography hankers after the condition of the neutral observer. But there can be no such thing as a neutral observer. For something to be seen, it has to be looked at by somebody, and any true and real depiction should be an account of the experience of that looking. In that sense it must deeply involve an observer whose body somehow has to be brought back in. In the nineties, Hockney got very involved with research on European painting, and in particular proposed that many painters of the fifteenth-century and for years afterwards were using mirrors and lenses to help capture images by reflecting them onto a 2-D surface, and tracing the details. Because most lenses had a small area of focus, they would need to be moved around to capture other areas of interest, leading to minor inconsistencies in perspective. This notion was initially not well received by the art world, but seems to have become more accepted in recent years. When photography emerged in the mid-1800s, this caused a series of revolutions in painting, and the idea of attempting to capture fully realistic details in painting became less interesting. 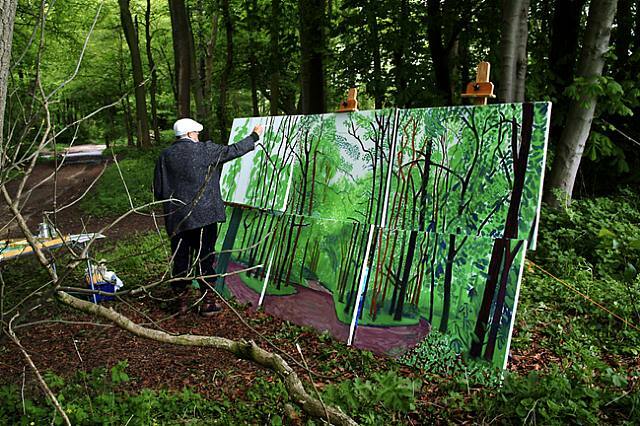 Hockney in recent years has gotten back into painting, mostly landscapes back in England, and he typically uses multiple painted panels. This allows each panel its own viewpoint, but the whole creates a more lived experience of seeing through painting. Weschler does a fantastic job of balancing the simultaneous goals of describing artworks, letting the artist express his intentions, and pulling the strands together. Highly recommended if you’re interested. Here are a few more shots from around the neighborhood! As you can see, it’s a line drawing style, and she simply relates the events of her trip, including lots of food and drink along with some visits to historic sites. I enjoyed this quick visit to Mexico. The other comic is in color, with an interesting accordian format. It’s called Lords of Death and Life by Jonathon Dalton out of Vancouver BC, and sample pages are shown below. If you click on the title link you can see the whole thing online. I have to admit I haven’t read it yet, but I thought it looked great and am looking forward to the read. One of the artists whose work made an impression on me yesterday at the Comics Fest was Theo Ellsworth, whose site www.artcapacity.com is worth a visit, along with his blog Thought Cloud Factory News. I picked up his drawing book Thought Cloud Shrines along with a print, Portrait of a Garden Gnome. He’s also got a book of drawings and comics called Capacity, shown below. I like his dense ink style, and the visionary imagination. He’s located here in Portland, and “He does invisible performance art that no one will ever see.” I like work that in some way tries to visualize the thought structures in our minds, that we’re constantly building and re-building. Today was simply a lovely day, so I was out and about, and had a camera with me today to capture a few views around the town. First stop today was the Stumptown Comics Fest, which was quite good – lots of exhibitors and lots of visitors. I picked up a few things, which I’ll try to cover in subsequent posts. Couldn’t resist shots of the big Franz loaf of bread (probably about 20 feet long, it revolves!). And more… a famous iconic sign that has been in the news lately, as the owner of the building it’s on wants to change it (but it’s already been changed several times in the past, so that’s OK). And below that, a nice ‘window’ at the Chinese Gardens. Everything that everybody else was bored by or appalled by, he was excited by. He wasn’t really interested in English literary parties and kept himself outside that. He was bored by the heritage of Central London and, unlike other writers, never wanted to talk about what he was writing. He preferred to talk about ideas, or some weird news cuttings he had brought along. Living out in Shepperton for so long, he was one of the first to undersand that the psychosis of suburbia was a fascinating thing to pursue. I assisted with the RE/Search reprint of The Atrocity Exhibition that came out in 1990, and still have a copy of the manuscript for the annotations that Ballard did for that edition. I remember that his short notes on certain surrealist art were very illuminating. I will miss this true individual. It’s a bit misleading to talk about money supply, because what money really is is roughly $2 trillion of cash and then $50 trillion in credit. Because what do the banks do? They take deposits in and then they borrow money to leverage them up. I take my credit card and I spend with it. I borrow against a house. I have an asset that rises, and I borrow against it. We have two trillion dollars of actual cash propping up $50 trillion in credit. If we all decided to settle and pay off everything, we couldn’t do it because there is not enough cash. There would be massive asset deflation. We, as a nation, are levered 25 to 1, or we were. Now, that $50 trillion is in a real sense the money supply because that is what we are all pretending is real money. I lend you money and you pretend you are going to pay me back. Then you pretend he [pointing at another attendee] is not going to call your debt for cash, and we are all going to keep the system going. Because if we all try to pay each other back at once, we are all collectively — and this is a technical economic term — screwed. So we keep the system going. Now, where are we today? We are at the Great Deleveraging. We are seeing massive losses and destruction of assets, on a scale that is unprecedented. There was massive destruction of assets during the Great Depression, which caused a lot of problems, and we are seeing the same thing today. We are watching trillions simply being poofed (another technical economics term – which will drive my poor Chinese translator crazy!). We are watching people pay down their credit lines, which is one way of saying the supply of money and credit is shrinking. He goes on to talk about the central bankers ‘genetic tendency’ to fight deflation with all guns blazing. Which force will win? And what does it mean for all of us? Read the column to find out more! The era of personal genomic medicine may have to wait. The genetic analysis of common disease is turning out to be a lot more complex than expected. Since the human genome was decoded in 2003, researchers have been developing a powerful method for comparing the genomes of patients and healthy people, with the hope of pinpointing the DNA changes responsible for common diseases. This method, called a genomewide association study, has proved technically successful despite many skeptics’ initial doubts. But it has been disappointing in that the kind of genetic variation it detects has turned out to explain surprisingly little of the genetic links to most diseases. Can’t say I’m all that surprised. I think in recent years the “man=computer” and “genes=software” metaphors have been way overdone, leading people to think that ‘cracking’ the genome would explain everything. While it’s surely important, and study should continue, I think there’s got to be a whole lot more going on. In related news, this post from Boing Boing is interesting… “Our ‘Missing’ Chromosomes” on the evidence of better explained linkage between human and ape genes, indicating that in humans chromosomes may have fused together which are separate in apes. 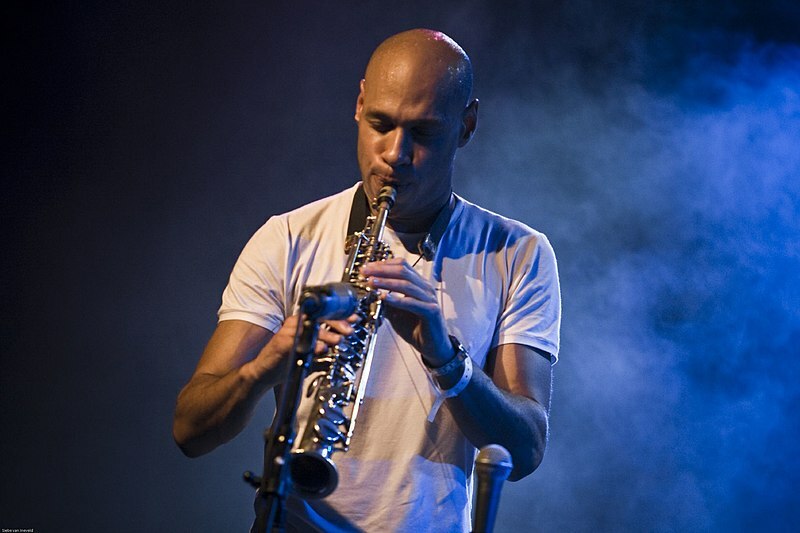 Last night I headed over to the Aladdin Theater in the ‘Brooklyn’ neighborhood, and saw the Joshua Redman Trio. Redman plays tenor and soprano sax, with Matt Penman on bass and Greg Hutchinson on bass. They played two sets and a quick encore, and I thought it was really an excellent performance. A nice variety of originals along with some standards (“Surrey with the Fringe on Top” from Oklahoma, and Monk’s “Trinkle Tinkle” among others). Penman was one of the more inventive bassists I’ve seen in awhile, often playing multiple strings at once, and Hutchinson showed a lot of range on drums as well. Now I need to see if Redman’s recent CD ‘Compass’ achieves the same level (hear some on his mySpace page)!